Sorry for the lack of updates! I've been working night and day over the last 2 weeks, so I haven't had time for much else! Total Weight Loss/Gain: Not keeping very close track, but I think I'm up about 10 lb. Maternity Clothes: Pretty much all maternity clothes at this point. I have some tops I can still wear, but very few. A friend gave me a big bin filled with her maternity clothes last weekend - bonus! It's mostly winter clothes, but I definitely found some good stuff! I bought a maternity bathing suit last weekend for our upcoming cruise, but I don't plan to buy any more maternity stuff if I can help it. Once the weather warms up it will be all skirts and dresses, all the time! Stretch marks: None yet (thank goodness). The belly still isn't huge, though. I'm still at the phase where people don't really notice I'm pregnant, I could just have a big gut! Sleep: So - so. Some nights I sleep great, other nights I'm up with heartburn. I found a natural heartburn treatment made with cider vinegar that works pretty well, also these papaya enzyme pills work pretty well. I'm trying to keep it natural, but I will pop a Zan.tac 75 if nothing else works. Amazingly, I'm back to getting up only once a night to pee. Movement: Feeling him moving around every day! Some days more than others, but he's definitely getting bigger in there. Symptoms: See above re: heartburn. I'm starting to have more lower back pain and I get sciatica pain when I get out of bed in the morning. Other than that, feeling totally fine! What I miss: Drinking alcohol and eating sushi. What I look forward to: Bunny being able to feel the kicks from the outside. My next ultrasound. Moods: Feeling great! I've been much more energetic and more productive at work. Medical concerns: I have partial placenta previa, which will hopefully resolve itself as the pregnancy continues. I also have "marginal insertion" of the umbilical cord (see last post for explanation) but it's not a major concern either. Today I had a fetal echocardiogram, which they recommend for all IVF pregnancies. The baby's heart looked fine, except for a very minor defect (called a VSD) in one of the ventricles which is quite common at this stage of development. It should close up before the baby is born. The doc didn't even see it on the regular ultrasound, he had to use the really fancy equipment to see it. He's not worried about it. 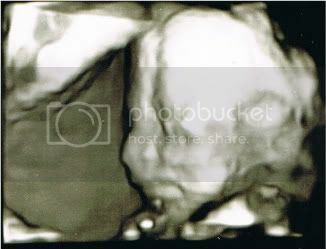 As a bonus, the doc gave me some 3D pics of the baby's face! Click here if you want to see one. Misc: Lots going on in the upcoming weeks. Next week we close on our new house! We were supposed to close in January, but it has been delayed due to some repairs on the part of the seller. It worked out fine for us, though, because our house is still on the market and shows no sign of selling anytime soon. We'll move in mid-April. 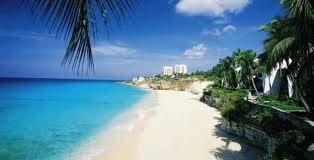 We are also getting ready to go on our cruise at the end of the month! Can't wait for that!! The scan went pretty well - it's a boy!! He's measuring totally normal and all his parts look fine. My mom, husband and MIL were in attendance and were excited to see their grandson. Two minor issues were discovered, however - my placenta is very close to the cervix, so I may have partial placenta previa at this point. But, this can resolve itself as the uterus grows. The other issue is that the umbilical cord is attached at the very edge of the placenta (it's usually right around the middle) and is also quite close to the cervix. Again, it won't cause any issues now, but could cause complications later in the pregnancy. 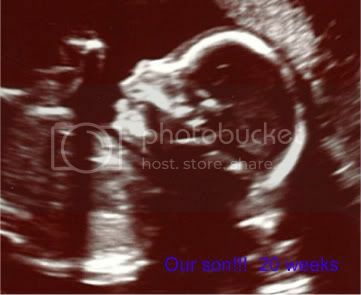 My next ultrasound is in 30 days, on April 2nd. I'll have a fetal echocardiogram next Friday (this was only recommended due to the fact that I had IVF, they don't think there's any issues with the baby's heart. 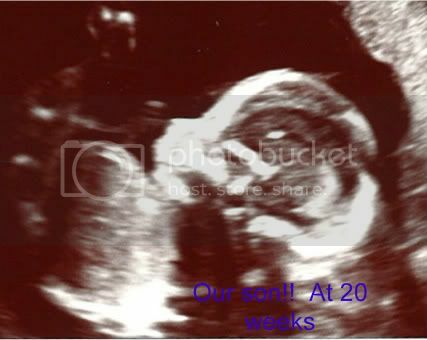 I'm not going to post any more sonogram pictures directly on the blog, out of sensitivity to my infertile friends, click here and here if you'd like to see some pics.